Peggy Carter: You can’t give me orders. 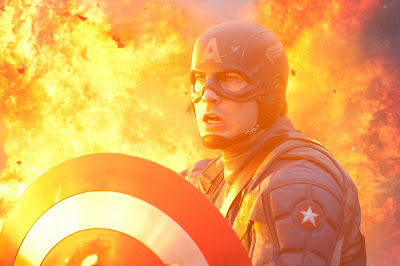 Captain America: The hell I can’t; I’m a captain. 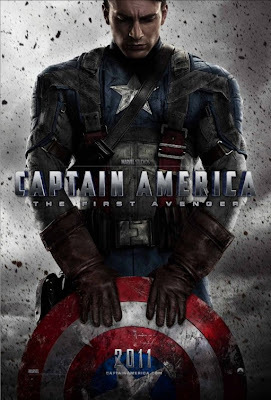 I was weary of CAPTAIN AMERICA: THE FIRST AVENGER before watching it but still optimistic. After all, I had been very pleasantly surprised by previous Avenger installments, IRON MAN and THOR. I had not expected either of those to be anywhere near as good as they were so the captain could still impress. So what if Joe Johnston, who has not made a solid film since 1991’s THE ROCKETEER, directed it? Who cares if it stars Chris Evans, who’s never done anything more memorable on film other than take off his shirt? And why should it matter that the film is coming in at the tail end of mounting audience superhero exhaustion? Unfortunately, all of these potential detriments come together quite nicely to create a disaster worthy of being called captain. Johnston takes a decidedly cartoonish approach to the iconic superhero, which could work given the film’s comic book origins but just comes off as amateurish. Before Captain America dons the uniform and shield he is known for, he was nothing more than a scrawny, scrappy boy trying to fight for his country. This is a problem as Evans is nothing if not a fine male specimen. To make Evans look that pathetic, his face was digitally plastered onto a smaller man’s body. The intention is good; the emotional attachment to the character would not have followed through the film if he were played by someone else in these earlier scenes. The execution is not great though as he looks more like a bobble-head than anything else. Throw in Stanley Tucci’s ridiculous German accent, the mad science experiments complete with sparks and electrical currents running through the air and Hugo Weaving with a red skull for a head and you’ve got a film desperate for credibility that undermines itself at every turn. CAPTAIN AMERICA: THE FIRST AVENGER had to happen to properly set up all the steps towards THE AVENGERS. I’m sure Evans will fit in just fine amongst those guys next year but for now, he feels trapped in a project that never comes together. Comic book movies are big movies; they need to play to wide audiences to justify their budgets but as gigantic as the comic book movie business has become, it does not mean that every one translates well to film. A different director might have made the difference here as there are semi-interesting themes that were only partially explored but Johnston tries too hard to appease the fans and the masses at the same time, which ultimately alienates both groups. Captain America has to prove himself for the longest time but thanks to this film, he only proves himself to be a joke. Shame you only gave it two stars… I had high hopes for this movie.. I was just wondering if you’d like to exchange links as I have a movie reviews blog too. I’ve already added you to my blogroll and I’d be grateful if you would do the same. If not, no worries! Yeah, this one was hobble right out of the gate by the necessity of setting up the Avengers. As someone who doesn’t mind crap special effects, the first half of the movie was glorious. But, like Sam Ramimi’s first Spider-Man movie, once the origin story’s complete, the film can’t figure out what to do with itself. So it does what it knows it has to do and moves its main character towards his mark with nary a care for its own dramatic architecture. I found at least two movies in the back half of this one, and in a sane world, this would be the first act in an epic, period-piece, Captain America trilogy. But Marvel’s so damn scared of that exhaustion you mentioned, they’re rushing these out to market as fast as they can. So we all get to suffer. Yeah, ultimately I see what they were trying to do here but there was either not enough time to really let it grow or they just didn’t know how to actually make it work. It felt like I was being rushed along with it the entire way out of necessity. Hollow experience. 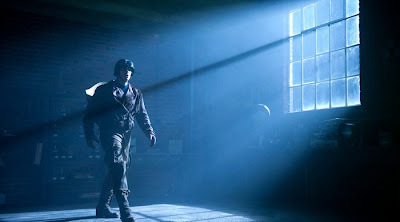 I had seen its trailer and poster its looking very nice and entertaining movie, Very well known director and producer also really such a nice story line and very talented star, the character is looking very Attractive in Steve Rogers Captain America Jacket he is the one of in very good looking Hollywood actors ….